Glenburn Soda Fountain & Confectionery. The Templeton. Photo by Dane Low. Sweet milkshakes slurped in between bites of juicy burger. Sunday morning eggs sunny side up with a stack of pancakes, and bacon cooked perfectly to a crisp. The sound of the jukebox in the distance; Mum and Dad sitting elbow to elbow with cups of bottomless coffee. As a youth, your local diner was a place in which to sit back and enjoy the comforts of a simple meal in good company. And although those slower, simpler times may be things of the past, nostalgia can still be found in the cozy booths of Vancouver’s remaining diners. Here, a raised milkshake glass to a few of the best. “We’re a mom-and-pop diner except we don’t have kids,” laughs husband and wife team Mark and Sondra Moody, owners of The Templeton. 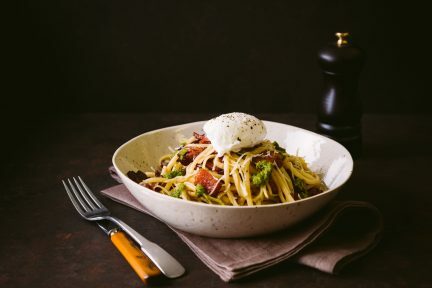 On the downtown part of Granville Street, the Vancouver institution is known for attracting locals and tourists for its hearty and delicious breakfasts. “It opened in 1934 as Adele’s Cafe; it started as The Templeton in 1996,” says Mark, seated in a red booth with a hot cup of coffee in hand. “What makes this different than most diners is that this is an actual 1950s diner,” he adds, explaining how the building is from 1908. The Moodys purchased the restaurant two years ago. This summer, expect to find something a little bit sweeter added to the menu, too. “My goal is to sell ice cream,” says Mark, as Sondra describes the to-go window and temporary patio currently in the works. 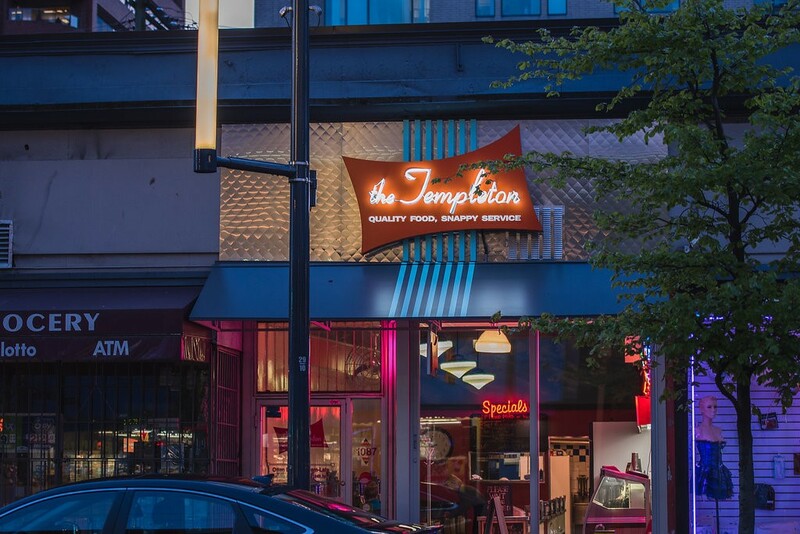 The Templeton already makes hand-blended milkshakes, with flavours ranging from key lime and candy bar to the classics. “We have people say to us, ‘I used to come here as a kid, and now I’m bringing my kid here,’” says Mark. If anything can span multiple generations, it’s comfort food and thick shakes. Heading west along Broadway, dodging the puddles and rain clouds, a bright light can be seen in the distance: a yellow and green palm tree. This is Moderne Burger, also known as Kitsilano’s favourite spot for all things hamburgers, fries, and milkshakes. All burgers are served on a freshly-baked sourdough bun, and customers can also enjoy the works with a wild salmon fillet, or a spiced ground turkey, steak, or vegetarian patty. “The special thing that we do that very few places do is that we cut the fries to order,” says Kokinis. Everything is prepared in the mornings, with his son mostly working the grill. 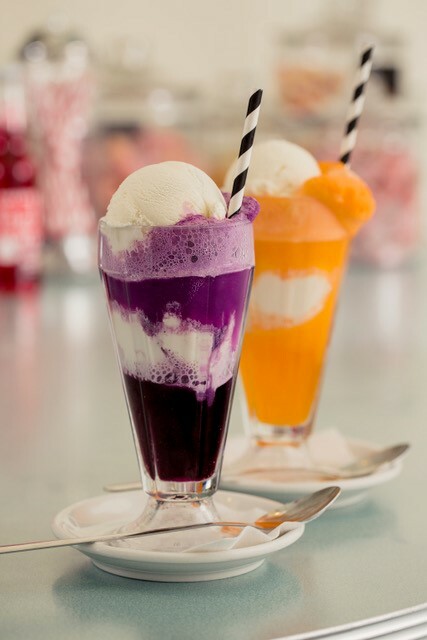 The shakes and floats are dreamy, and their flavours are sure to take many adults back to childhood. Moderne Burger is unique in that the spacious and comfortable design of the restaurant means it is quiet—that is, aside from the faint sound of Duke Ellington coming from the jukebox. UPDATE, April 2018: Due to an upcoming development along Broadway, Moderne Burger is closing on April 29, 2018. The restaurant plans to relocate, details to come. UPDATE, January 2019: The new Moderne Burger location is at 865 West Broadway, due to open late this month. “You can’t make an Egg Cream without Fox’s U-bet,” says Ron LaQuaglia, owner of Glenburn’s Soda Fountain in Burnaby Heights, as he hovers over a vintage 1931 soda fountain, waiting for the bubbles to emerge. Soda washes over the creamy bed of Fox’s U-bet chocolate sauce, a staple to many Americans just as Nestle Nesquik is to Canadians. As LaQuaglia adds full-fat Avalon milk and blends it ever so slowly, the top becomes frothy with foam. Delicious and decadent, the staple New York beverage is placed on a plate alongside a crunchy pretzel and slid across the countertop. The iconic New York Egg Cream is just one of the many sweet specialties found at Glenburn Soda Fountain. Wanting to bring something nostalgic and friendly to their neighbourhood, LaQuaglia and his wife Roberta opened the shop five years ago. 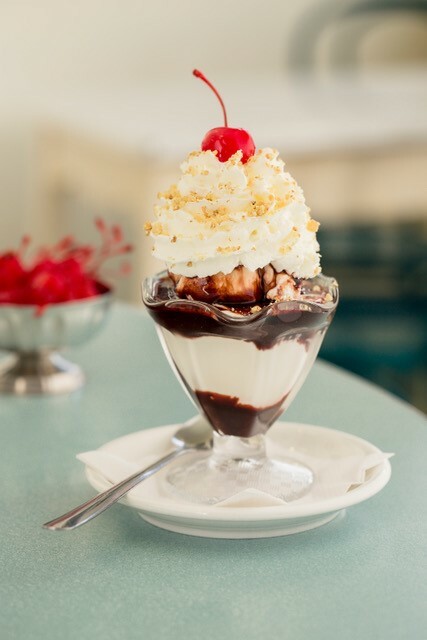 “We focus on a variety of menu items, everything from shakes and malts, to floats, to sundaes, to specialty sundaes,” says LaQuaglia, whipping up a second creation: the hot fudge sundae. “The ice cream comes from Birchwood Dairy in Abbotsford, and then we get our milk and cream products from Avalon in Burnaby,” he adds. The sauces are made in-house—try natural blueberry, raspberry, and strawberry versions slathered across the Brownie Sundae, Banana Split, or Peanut Butter Supreme. The space is clean and airy with seafoam and turquoise, and a large window lets the afternoon sunlight shine onto the antique and modern appliances. Above the counter, the Fountain Service syrups collection is on display; choose from over 10 soda flavours like cherry, grape, root beer, pineapple, strawberry, and even seasonal offerings, like the simply delicious lavender. “It wasn’t about speed back then, it was about making it right,” says LaQuaglia, pointing over to the seafoam-green Hamilton hand-blenders, which are used to make the creamy milkshakes. Just as the menu is all about keeping the sweet treats of the past alive, LaQuaglia is adamant about keeping the legacy of his community alive, too. “Glenburn” was the name of the neighbourhood in the phone directory in the 1950s, and there are even some decor pieces on the walls from the old Glenburn Dairy, which some guests have voluntarily brought in for safekeeping. A truly magical gem. In the heart of Kitsilano, the colourful Sophie’s Cosmic Cafe has brought in hungry guests for over 25 years. 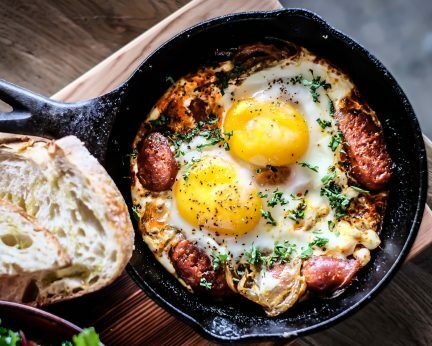 The comfort-food joint is known for its traditional breakfasts, drawing in local (hungover) UBC students, lifetime neighbourhood dwellers, and tourists for its quirky decor and year-round patio. Enjoy dishes like two eggs any style, Belgian waffles, a full stack of sweet pancakes, and a huge variety of omelettes (opt for the Deluxe Veggie). Fruit and granola are also here, along with an extensive lunch menu (think BLT, Greek salad, club house sandwich, and grilled cheese), but what many customers rave about are the delicious versions of eggs Benedict. The Sante Fe Benny has a corn tortilla base layered with salsa, avocado, and soft-boiled eggs; Jimmy’s Greek has feta and fresh tomatoes with dill and sour cream. Moving along to coffee, don’t be quick to judge Sophie’s as a drip-only kind of place. There’s the Sophie’s Viet Coffee (espresso over ice with condensed milk), and the David’s Cacao (Kahlua and Irish cream)—but a double Americano will suffice, too. Sophie’s is also fully licensed, meaning if looking to catch a boozy brunch, there’s no need to always choose Gastown. In 1942, the Ovaltine Cafe on East Hastings and Gore Street opened its doors, welcoming the neighbourhood into what is now one of Vancouver’s oldest casual dining establishments. The long-time staple of the community, which has survived ownership changes and a difficult Vancouver real estate market, gained recent attention worldwide after it came under the eyes and taste buds of The Telegraph’s Chris Moss, who dubbed it one of the top 50 greatest cafes in the world in 2018. Current Ovaltine owners Grace and Rachel Chen, the mother-daughter-duo who bought the establishment in 2014, are cherished throughout the neighbourhood, known for the affordable, large-portion meals they served at Save On Meats—which Grace ran from 1999 to 2010 while Rachel learned the ropes. It was during these years that the late, great Anthony Bourdain walked into Save On Meats in search of a famed one-pound burger to be highlighted on No Reservations. After purchasing the Ovaltine from a friend, the Chens moved their Bourdain-approved eats down the road, modernizing the menu—and serving a revised, but still hefty, Ovaltine quarter-pound burger between two buttered buns alongside mushrooms and the family’s secret sauce. For lunch, there is also fish and chips and Caesar salad, and a perfectly golden grilled cheese sandwich with chicken noodle soup or fries. And as breakfast food continues to change with the trends, be it avocado toast, an egg skillet, or an acai bowl, the Ovaltine is a testament to the classic diner staples: two eggs your way, a breakfast sandwich, and pancakes browned just right. Guests should also not miss the signature bourbon Ovaltine milkshakes, to be sipped on and enjoyed among the deep-set, quiet booths. The neon-pink sign splashed against the green exterior, the heavy door and the anonymity once inside, the coke bottle flickering above the vintage-style kitchen and hung among anecdotes and news articles from Vancouver’s past—the Ovaltine remains true to its diner origins. On top of all that, it is the candid service that makes any frequent visitor, old-school enthusiast, or tourist feel right at home. 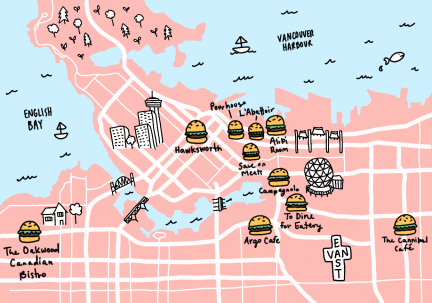 Vancouver has plenty of restaurants with modern decor and contemporary share plates, but for the days spent craving chocolate shakes and onion rings, thankfully the city has the places for that, too. Keep up with more Food and Drink.